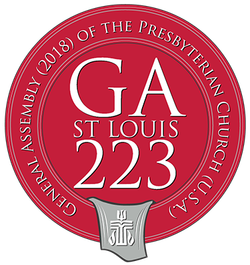 The 223rd General Assembly that met in St. Louis this June provided an opportunity for me to reflect back on ministry and the denomination. My first General Assembly, the 200th, was held in St. Louis in 1988. I had just completed my second year of seminary and was preparing for an internship year as a student pastor in Virginia City, Nevada. This was a time when commissioners were given reams of paper and the Assembly provided canvas bags in which you could tote supersized three ring binders needed to organize everything. Today, everything is done electronically and the commissioners no longer have to lug around reams of paper. When the Assembly was in session in 1988, seminary students acted as runners, taking slip of paper containing motions to the front. Today, even that is done electronically as motions are sent digitally to the podium and appear on large screens almost instantly as the person makes the motion. It seemed to me that there was a lot more political maneuvering at the 1988 Assembly. Crossing the street from the hotel to the Convention Center, advocates for various positions would force papers on you. There were those wanting the church to take a stronger position against abortion and others wanting us to take a more liberal position. Abortion and homosexuality were the biggest issues of the day, (with abortion being highlighted as Mother Theresa spoke at a breakfast sponsored by one of the advocacy groups). Out in front of the hall, protesting the denomination he’d left in the 1930s, was Carl McIntire. Carl left to organize the Orthodox Presbyterian Church and then split with them to form the Bible Presbyterian Church. He was a relentless sight back then, protesting at every General Assembly and meetings of the National Council of Churches. And the maneuvering wasn’t limited to outside the halls, as a battle raged inside as to who would be the next stated clerk. 1988 was still the era when many of those who stood for moderator were white male pastors of large churches. Today, such voices are almost absent. It seems that instead of electing a well-known moderator who would then nominate a vice moderator, today people run together with another candidate as co-moderators. This Assembly, two of the three sets of candidates consisted of two women, a white woman and the other a woman of color. Elder Vilmair Cintron-Olivieri and the Rev. Cindy Kohmann were elected as co-moderators. The Rev. Kohmann was a classmate at Austin Theological Seminary of our Parish Associate, the Rev. Deanie Strength. In 1988, the denomination had 3 million members, a large number of missionaries around the world, and skilled scholars producing Sunday School, evangelism and stewardship materials. Today, our membership is a little over 1.4 million and we have many fewer missionaries and scholars working on denominational resources. However, the percentage loss of membership over the past two years dropped significantly as fewer churches are exiting the denomination. Someone said (I haven’t been able to find the validity of the statistic) that since 2012, eight of our ten largest churches have left the denomination. I wish our denomination would take this decline seriously and spend time in prayer and discussion about how we can reach others with the gospel message that Christ is Lord. The three most contentious issues at the General Assembly this year were a reorganization of the denomination’s structure as presented by “The Way Forward Committee,” a call for the divestment of fossil fuel investments, and a significant increase of per capita (the amount presbyteries must pay, based on membership, for the operation of the Office of the General Assembly). However, the battles seemed minor compared to previous Assemblies that I have attended. There is a sense that as a denomination, we are tired of fighting. The “Way Forward” adopted reshapes the denomination structure and the relationship between the Office of the General Assembly and the Presbyterian Mission Agency. It also strengthens the Stated Clerk’s role of speaking pastorally for the denomination between Assemblies. The call for divestment, while debated heavily, failed. Those fighting against divestment made the case that staying as a stock holder of such industries allows the church a voice at the table. Divestment was also discouraged by the Mission Responsibility Through Investment (MRTI) committee. Such a move would have been more symbolic as the denomination holds a minor stake compared to the volume of available shares. Moreover, the two largest investments funds within the denomination (the Presbyterian Foundation and the Board of Pensions) are both independent. While they are advised by the MRTI, the money they manage is held in trust for the shareholders (congregations and those invested in pensions). During the winter, the Office of the General Assembly voted to encourage the 223rd General Assembly to significantly raise per capita by 40%. The per capita for 2018 is $7.73 per member. Eventually the Assembly voted to approve a more modest increase of 10%, setting the per capita for 2019 and 2020 at $8.50 per member. Worship and Bible studies were two of the highlights during the week in St. Louis. The Assembly always includes creative worship leadership with a blend of new and old music. The Rev. Najla Kassab, president of the World Communion of Reformed Churches, called the denomination to continue its work toward transformation, reconciliation and peace. The offering from this service was given to the Deirminas Presbyterian Dispensary, which is operated by a church on the Lebanon/Syria border to provide medical supplies refugees fleeing Syria. As this General Assembly was held in St. Louis, where police shootings of a young African-American in nearby Ferguson caused a national movement, there was much emphasis on what the church could do to bring about racial reconciliation. One thing enacted at the Assembly was a collection to be used for bail money for some being held on minor crimes (under $5,000) and who were unable to pay bail. Many of those held in jail with minor crimes lose their job or housing when they are unable to provide the required cash bail that often only a few hundred dollars. On Tuesday, after committee meetings, a large group of commissioners marched down to the courthouse to present this offering, an event that received much publicity in the local press. As an observer to the Assembly, in addition to seeing the commissioners in action, I was blessed to be able to catch up with many friends and former colleagues and make new friends. On Thursday night, after the Assembly broke, I had to chance to meet and have dinner with the Rev. Nancy Pearson, the pastor of the church in Cedar City, Utah, where I used to be the pastor. It was fun to catch up about the exiting things happening in Utah. While there are many things troubling our denomination, there’s still plenty of life. The leadership of the Board of Pensions and the Presbyterian Foundation is strong and hopeful. The Board of Pensions is looking to create ways to help small churches with limited resources to fund a called pastor. The Foundation continues to provide money for mission work around the world. We will continue to seek modern ways to be the Presbyterian Church (USA), but we will also place our hope—not to these organizations or the General Assembly—but to Jesus Christ, the Lord of the Church. Sounds like things have changed a bit over the years. “The call for divestment, while debated heavily, failed. Those fighting against divestment made the case that staying as a stock holder of such industries allows the church a voice at the table.” This sounds exactly like the result of the vote on divestment in the Church of Scotland. The opposite argument is though that, in the case of the CofS at least that they’ve been engaging with the industries for years and haven’t made any difference whereas if they take their money out of the industry then in combination with so many other stakeholders taking their money elsewhere they can force the industries to rethink as money is indeed the bottom line. Thie other issue there is where else do you invest your money as fossil fuels aren’t the only damaging industries…. Craftygreenpoet, one of the problems with divestment as a motivator of behavior is that selling stock doesn’t hurt the one whom you want to change the behavior of (unless it owns a large chunk of its own stock that it wants to sell). When the stock was first sold, the company obtained the capital it was seeking. After that initial offering, the stock is just being traded between one shareholder to another. It could be argued that selling the stock actually opens up more opportunity for those wanting to buy into the company to be able to do so cheaply, since flooding the market with shares would draw down the price. Thanks for updating me on what the Church of Scotland did this year.